Hello once more, shared-universe fans. I hasten to point out once more that I am not the singularly ugly person to the left. That is Abraham Lincoln, one of our greatest presidents ever. And unlike previous Presidents we've chronicled here, George Washington and Thomas Jefferson, Mr. Lincoln has an impressive history of crossovers and fictional appearences built up around himself. But then, we should expect nothing less from one of the best friends of Bill and Ted, the Great Ones. It should be noted here at the outset that this article relys heavily on the theory that Bill S. Preston, ESQ and Ted Theodore Logan are the founders of the Time Lord race. Their music informed all aspects of Time Lord society, and until the Last Great Time War destroyed them, made the Time Lords a shining light to all of space. Bill and Ted's successive phone booths were generation after generation of the newly explored time travel technology. This theory will be explored more in depth when the upcoming Bill and Ted timeline is published. 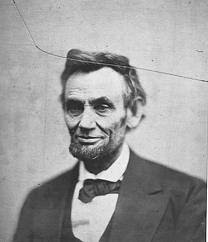 February 12, 1809—Abraham Lincoln is born in Illinois. March 4, 1861—Abraham Lincoln becomes President of the United Sates of America. April 12, 1861—The American Civil War begins. Jughead’s Time Police revealed that Jughead was, by some accident or mistake, the ace agent of the Time Police—and that his seeming lack of interest in girls was because he was secretly dating his partner, January McAndrews (Archie’s great-great-great granddaughter). The Third Doctor gives Lincoln detailed plans about the Battle of Gettysburg to ensure a Union Victory. Readers may object to the number of Doctor Who references on this particular timeline. But remember, Bill and Ted were the founders of both the TVCU Time Lord race and the Whoiverse Time Lord race—and so the Doctor would have an express interest in preserving the personal timelines of the Great Ones’ Historical Dudes to preserve his own existence. At the end of the story, Screw-On is given orders to take care of anything supernatural lurking in the western territories. The Fifth Doctor protects Lincoln from an assassination attempt in Richmond, Virginia. The Eighth Doctor warns Lincoln not to go to the theater, but Lincoln does not take his advice. It is unclear why the Doctor wished to interfere with historical events, especially events that struck to close to the histories of the Great Ones. April 15, 1865—Abraham Lincoln is reportedly assassinated by John Wilkes Booth. There is another curious fact. Over the decades another conspiracy theory has grown up around the assassination, one which records that instead of being a passive victim, Lincoln was forewarned of the attack, and, as the internet tells me, Lincoln shot first! Some possible evidence for this can be found in the opening sequence of Police Squad. June 22, 1865—The American Civil War ends. Lucas and Mark McCain try to figure out if a seemingly insane man living in their town is actually the ex-president, or an insane man. Bill and Ted only want to start a rock band in their garage and slack off for the rest of their lives. But if they fail this year of school, their junior year of high school, Ted will be sent off to military school in Alaska! Worse, in the future their music is responsible for the foundation of a nearly perfect time traveling society—and if Ted goes to Alaska, the future is destroyed. The only way to save their most egregious grades is to pass the History Exam. And that is a most hopeless proposition—especially since their studying tactic is to ask people outside the Circle K random questions about history. So the future sends them a time traveling phone booth; and so, they must kidnap “Historical Dudes” and use their knowledge to pass the test. 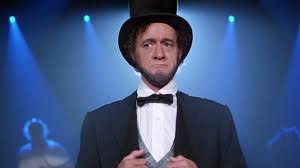 Bill and Ted kidnap: Napoleon, Socrates, Billy the Kid, Sigmund Freud, Bach, Beethoven, Genghis Khan, Joan of Arc, and most importantly for our purposes, Abraham Lincoln. The Historical Dudes are arrested for causing a riot at the mall—Lincoln was thought to have stolen his clothes from a gimmick-photo shop—but are rescued by Bill and Ted, and then everyone goes and helps Bill and Ted pass their exam. Somehow, everything turns out okay. Crossover notice: the footage of Napoleons troops attacking Moscow comes directly from the 1950s movie version of War and Peace, resulting in a cockeyed crossover between Tolstoy’s novel and Bill and Ted. 1988—At some time around this year, Bill and Ted take Lincoln, Billy the Kid, and Napoleon to a trash festival (Bill and Ted’s Excellent Comic Book #6). Bill and Ted invite all of their friend to come to see them renew their vows to their Princess Babes Joanna and Elizabeth. Lincoln has, by this point, become one of their closest friends (and the one most likely to randomly party! )—and he assists them in taking care of the time-lost criminals who try and murder Bill and Ted. Crossover notice: Hergé famous reporter Tintin was also invited to the vow renewal. In the wake of the vow renewal, Death has retired and ran off with a second-generation TARDIS for a much needed vacation. This would be bad enough, but Hell is giving up its dead and zombies are wondering about Bill and Ted’s house, making a mess of things. Lincoln, Billy the Kid, and Napoleon battle the zombies back—then, later, force them to clean up the mess they’ve made. Death running off would be bad enough, but this storyline must occur at the same time as Sandman: Season of Mists. Satan has abandoned Hell (for a time, at least) and all of the damned souls are forced back to walk the worlds they left at death, which explains the zombies surrounding Bill, Ted, and Lincoln. At this time the exact relation between Bill and Ted’s Death and Sandman’s sister, Death, has not yet been fully determined. In the final part of a many-issued homage to Doctor Who’s “Trial of a Time Lord,” Bill and Ted are rescued from the literal embodiment of time by a cavalry made up of their wives, Abraham Lincoln, Genghis Khan, Billy the Kid, Napoleon, and Death. Also: all of the people who escaped Hell issues ago finally end up back where they belong. After an entire lifetime spent in our public school system, Bill and Ted finally learn that Abraham Lincoln was assassinated. They embark on a mission to save his life, but only make things worse by twisting time into a paradox that results in a future world where the Soviets won the cold war. Somehow, Bill, Ted, and Death manage to set time right. Though the comic does not say as much, Lincoln agrees to die if it means life for his country. Death then drags Bill and Ted to Heaven—where Lincoln is Head Party Organizer, and has traded his trademark black suit and stovetop hat for an outfit all in white. Crossover notice: one of Bill and Ted’s many plans, as seen on their blackboard, is to contact Spider-Man. Abraham Lincoln is in attendance at the first birthday of Bill and Ted’s sons. This episode of Weird Science is the first appearance of Gary Bullock in the role of Abraham Lincoln, a role he would reprise in twice each in Sabrina the Teenage Witch and Teen Angel. I am treating all of Bullock’s appearances as the president as crossovers; Weird Science and Sabrina are already in the TVCU, thus only Teen Angel is brought into the TVCU by Bullock’s Lincoln. 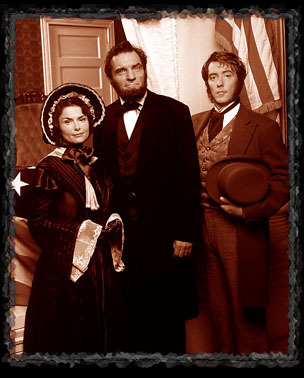 I include this show on the basis of Gary Bollock’s portrayal of Abraham Lincoln. I’m inclined to treat his Lincoln, which appeared on a number of 1990s television sitcoms, as a crossover of sorts. Thus the inclusion of Teen Angel in the TVCU. It is highly unlikely that Rod is God’s cousin, however; more likely he’s an angel who knew that if he didn’t give himself a highly inflated resume, the dimwitted Marty and Steve would have ignored him. In “Who’s the Boss” Marty and Steve throw a birthday party, inviting both cute girls and famous dead people—among them (the famous dead dudes, not the cute girls) Abraham Lincoln. After his journeys with Bill and Ted, Lincoln has come to love a good party! Sabrina’s aunt attempts to get Lincoln to advise her campaign for mayor, but he refuses and returns to Heaven. One more thing. 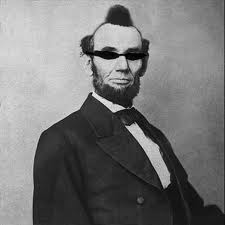 My sources tell me this picture of Lincoln was taken surely after the Bill and Ted induced "thrash festival." Feel free to join the discussion at our <a href="http://www.facebook.com/#!/groups/146387439534/">Facebook group</a>! (Take note that due to a long standing HTML error, I cannot usually respond to comments on the blog itself. So if you wish to get in contact with me, Facebook is the way to go.